A suburban London teen finds her traditional education replaced by something slightly more sinister when an older, more worldly suitor sweeps her off of her feet while placing her future in jeopardy. 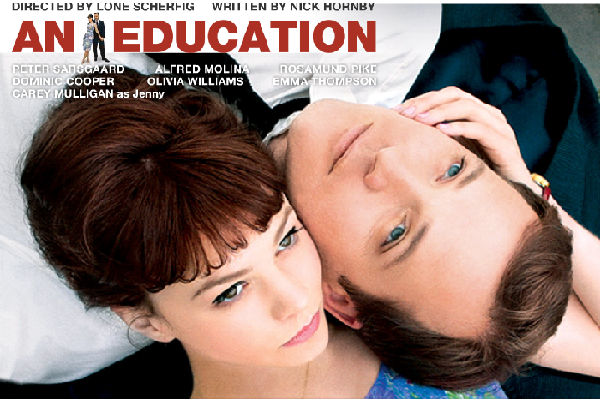 London, 1961: 16-year-old Jenny (Carey Mulligan) is smart, attractive, and eager to start her adult life. She’s grown tired of the familiar adolescent routine, so when urbane newcomer David (Peter Sarsgaard) appears in town, Jenny senses a rare opportunity to shake things up a bit. Quickly falling under David’s spell, the impressionable Jenny begins accompanying her newfound beau to classical concerts, art auctions, crowded pubs, and dinners that stretch into the small hours of the night. But Jenny is brighter than most kids her age, and her parents always dreamt of getting their exceptional daughter into Oxford. These days it seems like she’s headed in a different direction — will David ultimately be her undoing, or the person who helps her finally realize her true potential? Los espacios y horarios de proyección serán el Teatro Apolo, en Almería, los jueves en doble sesión, a las 20:00 y a las 22:00 horas, y en la Escuela Municipal de Música, Danza y Teatro de Roquetas de Mar, los miércoles en una única sesión, a las 20:30 horas.